Well the holidays are right around the corner so why not give our readers one last Apps for Less before the new year. Now is your chance to grab a very addictive game, Topple [iTunes Link], and you can't complain about the price when it's FREE. This is a limited time offer so be sure to grab it as soon as possible. How many of you still require hands free voice dialing? Well if Apple will not give you what you want, you always have the 3rd party developers! Enter Voice Dial... [iTunes Link] It may not be 100% perfect, but it's better than what you have already no? Next up is a little app called Touch Physics. What is the goal of this game you ask? Simply to get the ball from the start to the star. To do this you will need to construct different objects on each level by drawing with your finger and everything is based on real physics. Worth a try, especially for $.99. 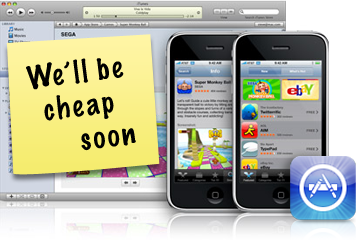 Note to Developers: Are you a developer and have any apps in the App Store going on sale or that you simply think is a great deal? Contact us and let us know to include it in a future Apps for Less!